I have created mini-Lesson reading skill and vocabulary skill booklets for each week of the unit. 1. Students should read the text before they complete these graphic organizers. 2. The reading skill anchor chart should be taught before they fill in the graphic organizers. 3. After they read the text, they should fill in the graphic organizer that is tailored to the reading skill. 4. They should also be taught the vocabulary skill. 5. After you teach them the vocabulary skill they should complete the vocabulary mini-lesson to reinforce the skill. 6. I try to reinforce the vocabulary skill during the second read of the story. Sometimes the stories do not lend themselves to teach the vocabulary skills adequately and it will reflect in the stand-alone vocabulary skill lesson. Suggestion- Check out the SPADE Booklets I created to assess reading comprehension. Each booklet contains a front page which will have the anchor chart that teaches the reading skill and vocabulary skill. The inside has a graphic organizer/activity to help teach the concepts. 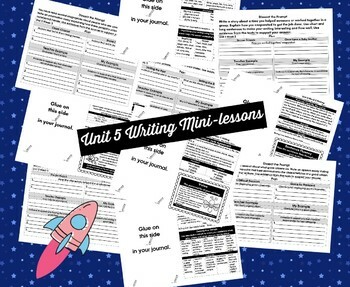 I have also created writing booklets that have the writing trait lesson and grammar lessons for each of the weeks in the unit. 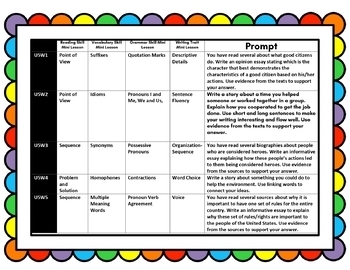 These are created for the students to learn how to respond to a writing task. 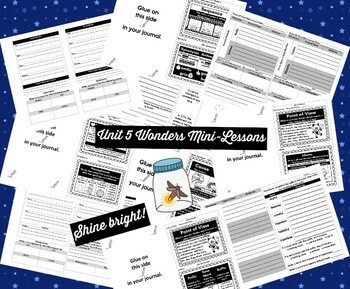 These booklets match the essential questions of the wonders series and have matching writing prompts to help the children learn how to cite text evidence to support their answer. 1.We dissect the writing prompt and this helps the students understand the basic components of a writing task. They box the topic, circle the genre and underline the task in order to start attacking writing tasks. Suggestion- See anchor chart I use to teach how to dissect a prompt. 2. Then we use the graphic organizer to help organize our response to the prompt. This will prepare the to answer a writing prompt with an introduction, body and conclusion paragraph. The graphic organizers are tailored to help struggling writers obtain the skills they need to build confidence in their writing ability. There is a section where the students will fill in the basic requirements of the task. There is also a section where the teacher models the writing task and the student shows their understanding. I usually do the modeling in red pen to show evidence of explicit teaching. 3. Then the students proceed to learning the grammar skill of the lesson. The grammar skill matches the one in the wonders series and I picked the most important one for them to focus on. I include real world use in the writing modeling to teach students how to use that grammar skill adequately. 4. We focus on the writing trait using the anchor chart in the front. His will help them build the foundation of writing traits. REPETITION IS KEY. I usually review the anchor chart every other day to ensure they have the understanding of how to use the writing trait to their advantage. 5. Using this booklet you model a quick response to answer the writing task. You should refer to the planning pat of this booklet to help students begin understanding how to STAY on task! The students should start writing their own responses after you have adequately modeled. Please understand that this is a learning process for them. I begin with a paragraph and gradually release them to three paragraph writing, in the beginning they are writing to respond to the task and most prompts are expository. Towards the middle I introduce gathering text evidence, and this helps the students cite text evidence to support their claim. Each booklet contains a front page which will have the anchor chart that teaches the grammar skill and writing trait. The inside has a graphic organizer/activity to answer the writing prompt. I taught English Language Learners, Non-Readers, Gifted students and SPED students with these booklets. My students made intense learning gains. My students scored a 1-3 on the SAT in the first grade. After using these booklets, they scored 6-7 on the second grade SAT test. This was life changing for me because it helped me teach the concepts effectively since I had everything ready to teach.